Discover this wide-travelling route; enjoy visits to Guilin, Yangshuo, the Longji Rice Terraces and sights around Nanning. 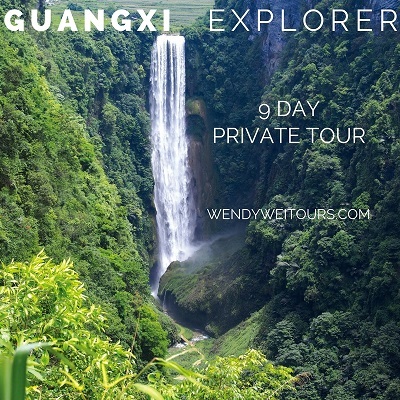 This private tour is a tour of a number of the major highlights and famous landmarks within Guangxi Province held over nine days and eight nights with your own experienced Wendy Wei Tours local guide. 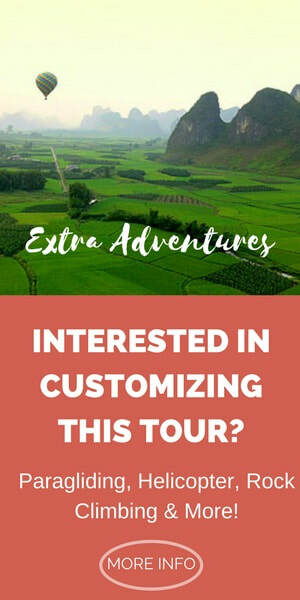 If interested in customizing your tour experience, please let us know when you inquire about this tour or other tours. Visitors stay in a number of different destinations throughout the entire tour. This tour consists of full days and activities on some evenings. Arrive into Guilin the day before your tour is scheduled to begin or alternatively, activities/itinerary/day order can be changed to reflect your arrival time. In the afternoon, partake in either a Private Taichi Class with a local taichi master, a Calligraphy Class or a Fan-Painting class, depending upon preferences. During the evening, you’re welcome to explore the hustle and bustle of West Street, tasting some of the local cuisine (beer fish!) before being transferred to your hotel for the evening. In the morning, visit a local rural market day held in different surrounding towns of Yangshuo. These rural markets are now rare in China and visiting one is like stepping back in time to what traditional markets used to be! See the farmers travel from all around the region on different dates to sell their produce and fresh vegetables. There’s nothing to ‘buy’ as it’s more of a rural market but a good insight into life in the countryside and into what used to be common everywhere in China! Following the market day, travel to Shitoucheng Stone Village, which is an ancient village located in the hills surrounding the Li River. Then, move to Xianggong Hill to see a spectacular bird’s eye view overlooking the Li River. Afterwards, board your own Private Li River Cruise, travelling along what’s considered to be the most beautiful section of the Li River and experience a Cormorant Fisherman demonstration. In the evening, watch the famous Impression 3rd Sister Liu Show, with over 700 actors and actresses held on the banks of the Li River before returning to your Yangshuo hotel at the show’s conclusion. Begin the day by travelling to Silver Cave – a large, spectacular cave located outside of Yangshuo. The cave itself is younger than the more famous Reed Flute Cave but is an impressive and famous cave. After arriving at Ping’an Village, walk to the different scenic lookouts and further explore the Longji Rice Terraces, depending upon your preferences. Enjoy the evening at leisure at Ping’an Village. In the morning, meet your guide and driver before travelling to the Detian Waterfalls. The journey from Nanning to Detian takes approximately 3.5 hours. The Detian Waterfalls are located on the border of China and Vietnam and are an impressive set of falls. Visitors typically spend a few hours at the waterfalls, looking at the falls from different angles and the surroundings. Afterwards, visit the nearby Tongling Grand Canyon, before returning to Nanning in the late afternoon. Enjoy the evening at leisure. Start the day by visiting the Guangxi Museum of Nationalities, which is a large museum located in central Nanning detailing the history and other interesting information about the various different ethnic minorities within Guangxi Province. Following the visit, transfer to the Nanning Train Station for your departure train back to Guilin. Upon arriving in Guilin, visit Elephant Trunk Hill, the famous landmark of the city before walking around the central lakes that overlook the pagodas. For lunch, travel across to the island of Maozhou, where you will enjoy an organic meal at a farmer’s restaurant before returning to Guilin. In the afternoon, visit Reed Flute Cave before your flight departure or evening at leisure in Guilin to conclude the tour.